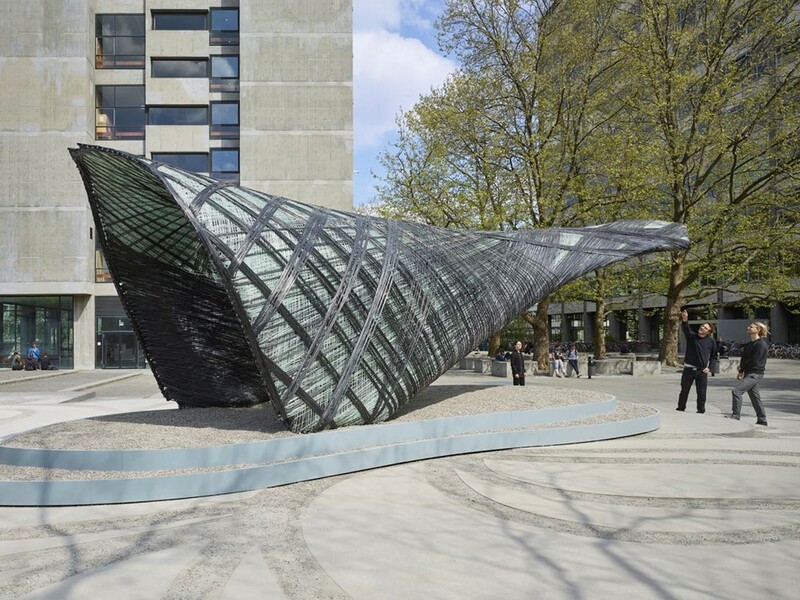 The Institute for Computational Design and Construction (ICD) and the Institute of Building Structures and Structural Design (ITKE) at the University of Stuttgart have completed a new research pavilion exploring building-scale fabrication of glass and carbon fibre-reinforced composites. 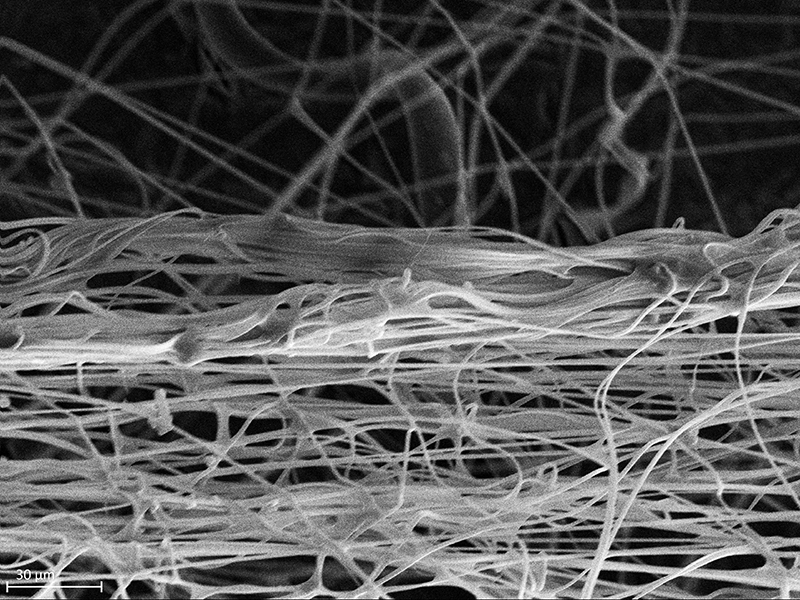 The novel process is based on the unique affordances and characteristics of fibre construction. 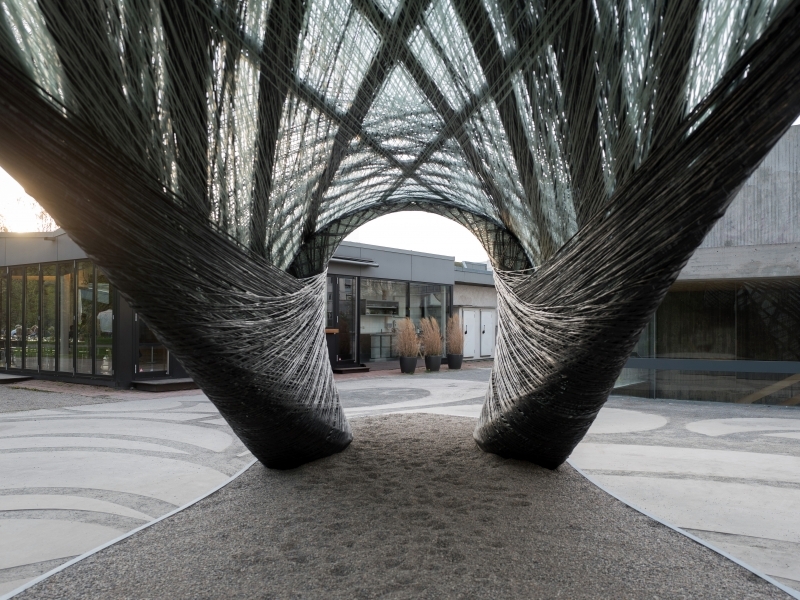 Because these materials are lightweight and have high tensile strength, a radically different approach to fabrication becomes possible, which combines low-payload yet long-range machines, such as unmanned aerial vehicles (UAV), with strong, precise, yet limited reach, industrial robots. 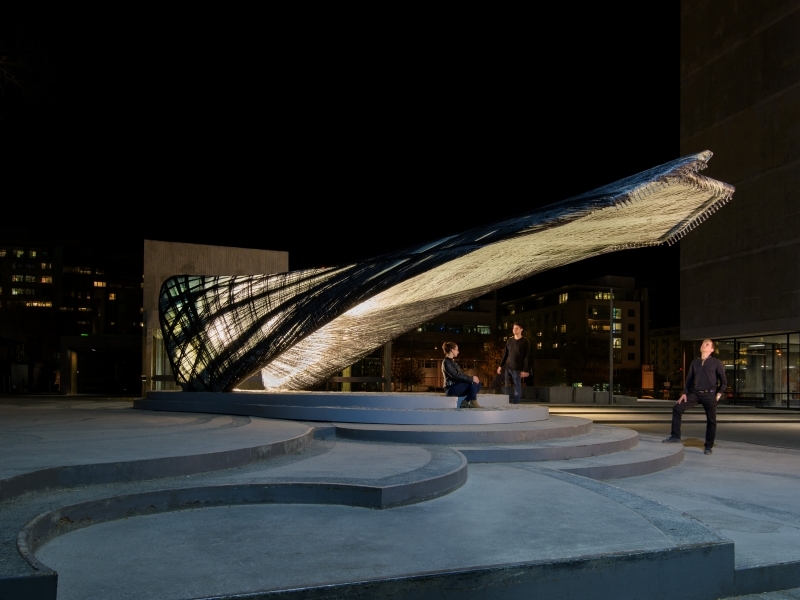 This collaborative concept enables a scalable fabrication setup for long span fibre composite construction. 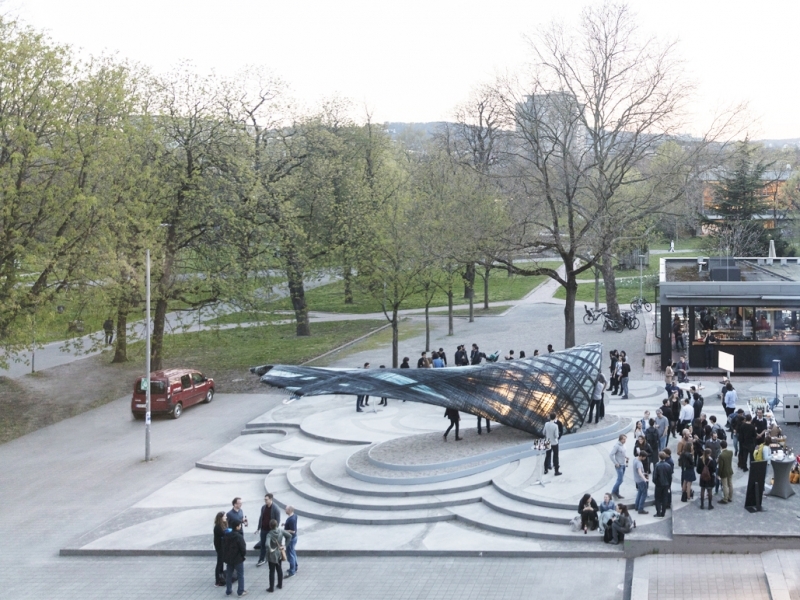 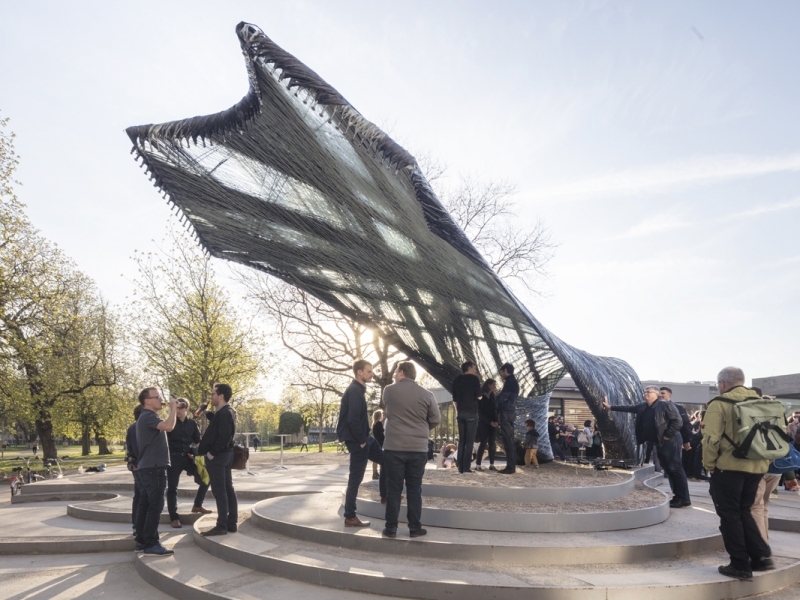 The research builds on a series of successful pavilions, which investigate integrative computational design, engineering and fabrication, and explores their spatial ramifications and construction possibilities. 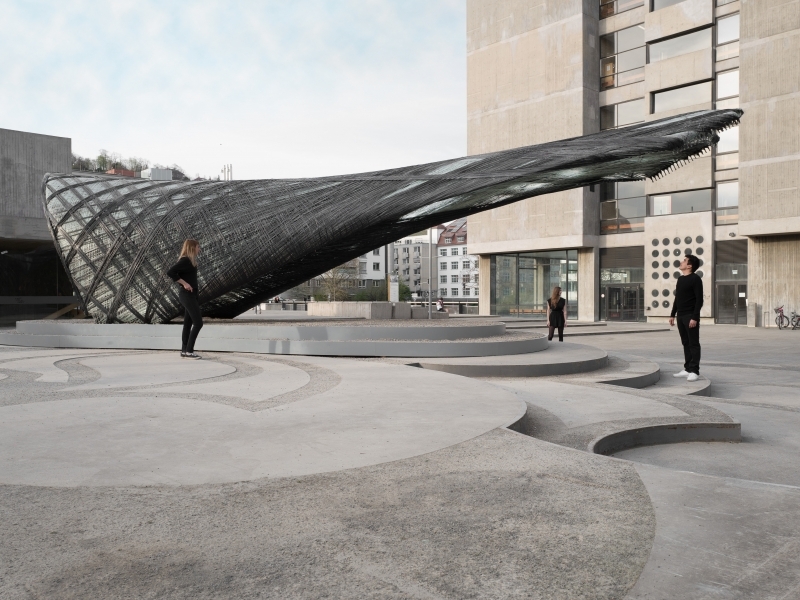 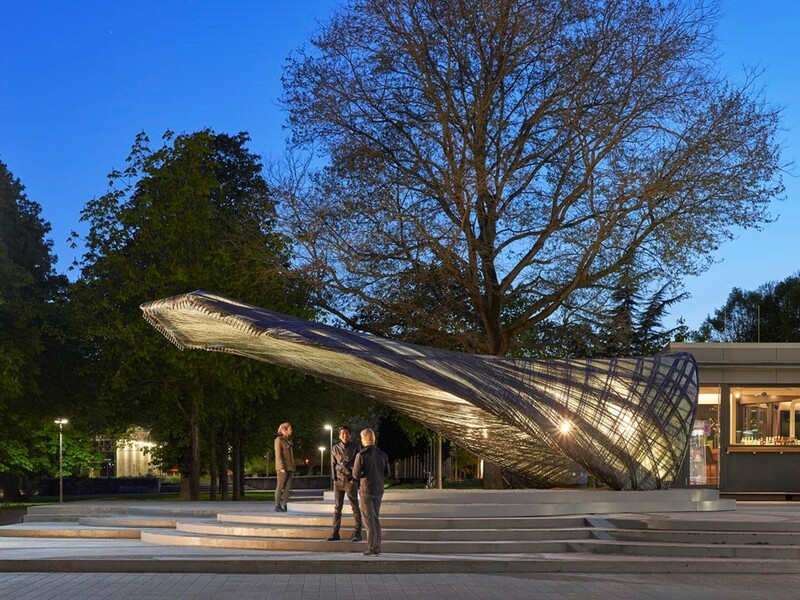 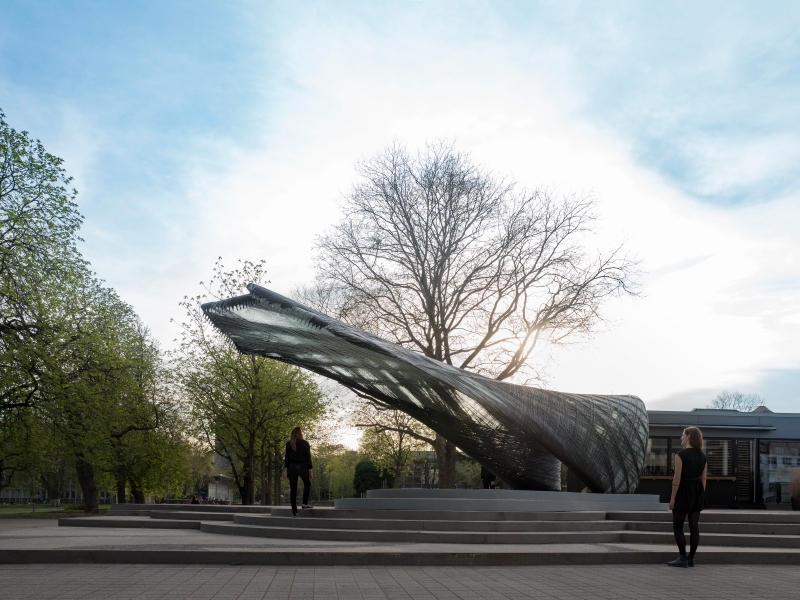 The project was designed and fabricated by students and researchers within an interdisciplinary team of architects, engineers and biologists. 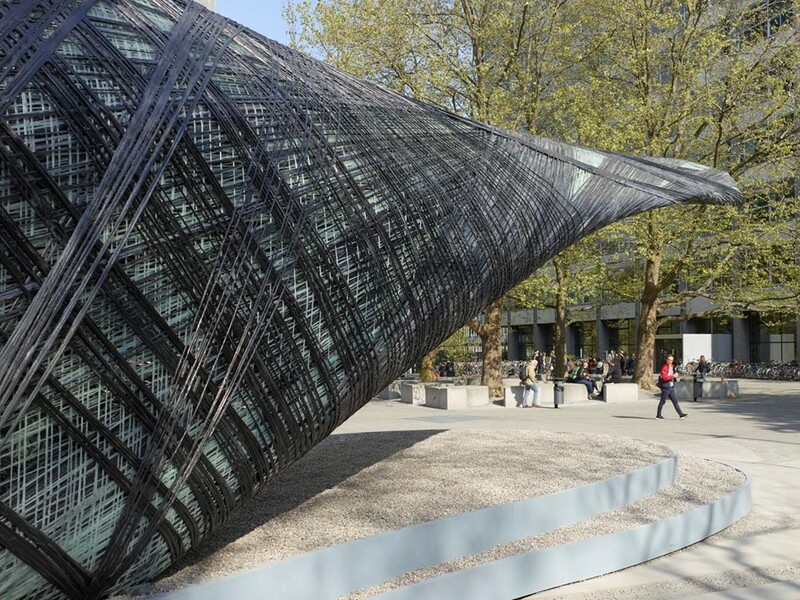 Fibre composite materials have tremendous potential in architectural applications. 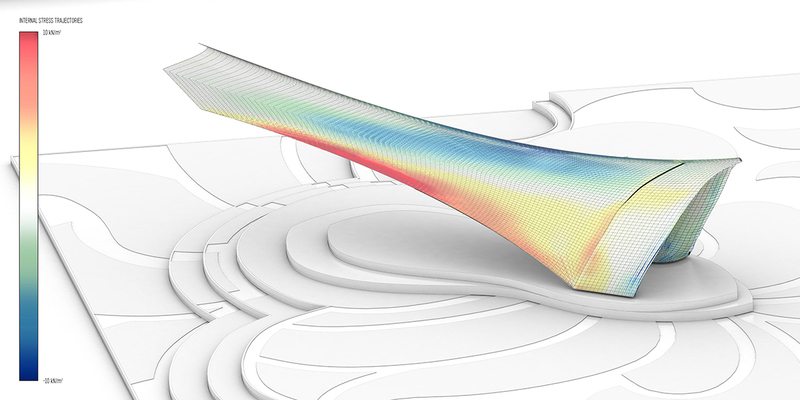 Due to performative material characteristics, they are readily used in highly engineered applications, such as in the automotive and aerospace industries. 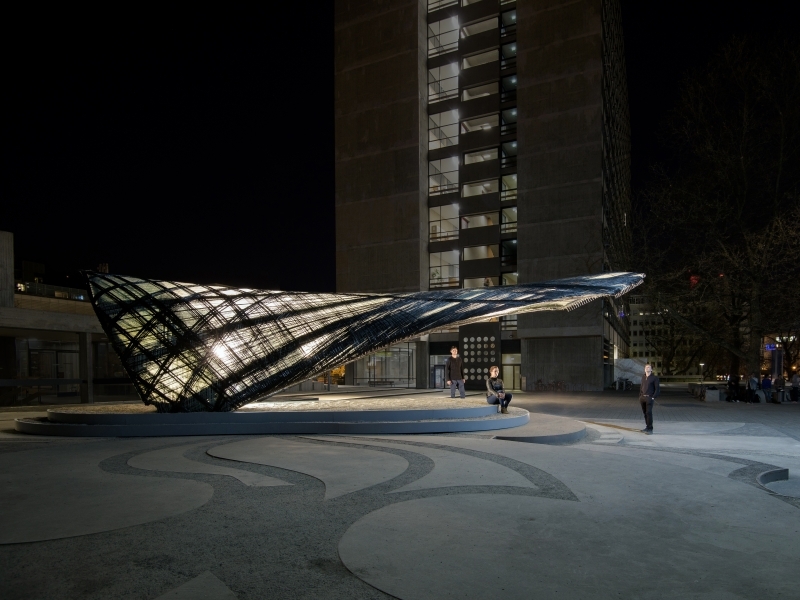 The potentials within architecture, however, remain still largely unexplored. 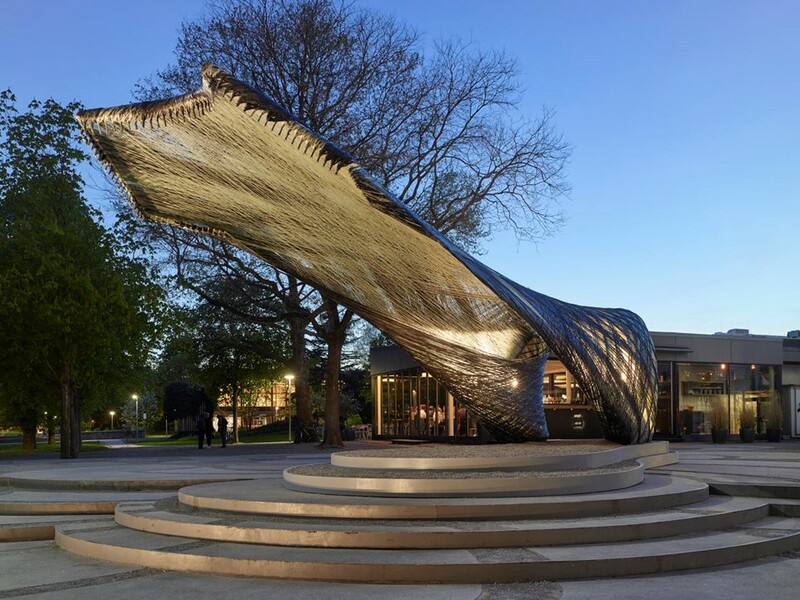 Within architectural scale production, where material self-weight is of high concern for larger span structures, lightweight fibre composites provide unparalleled performance. 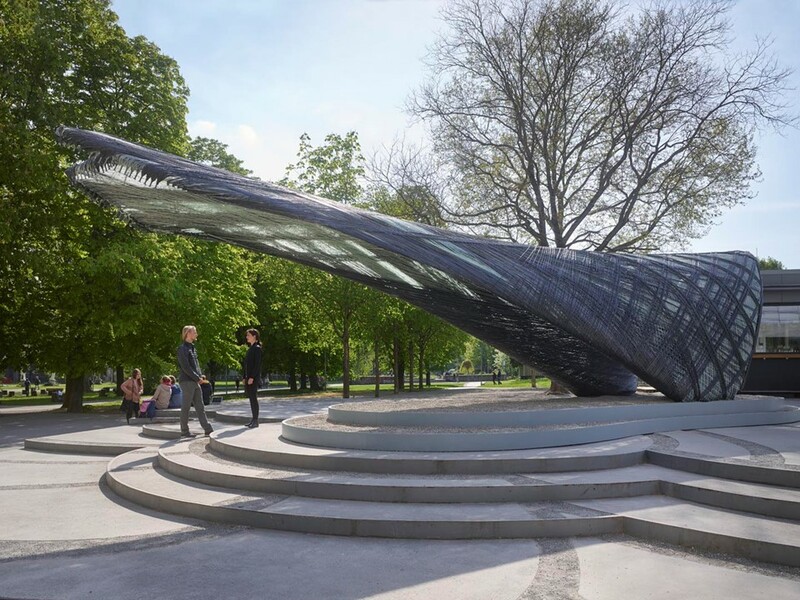 However, we currently lack adequate fibre composite fabrication processes to produce at this scale without compromising the design freedom and system adaptability required for the architecture and design industries. 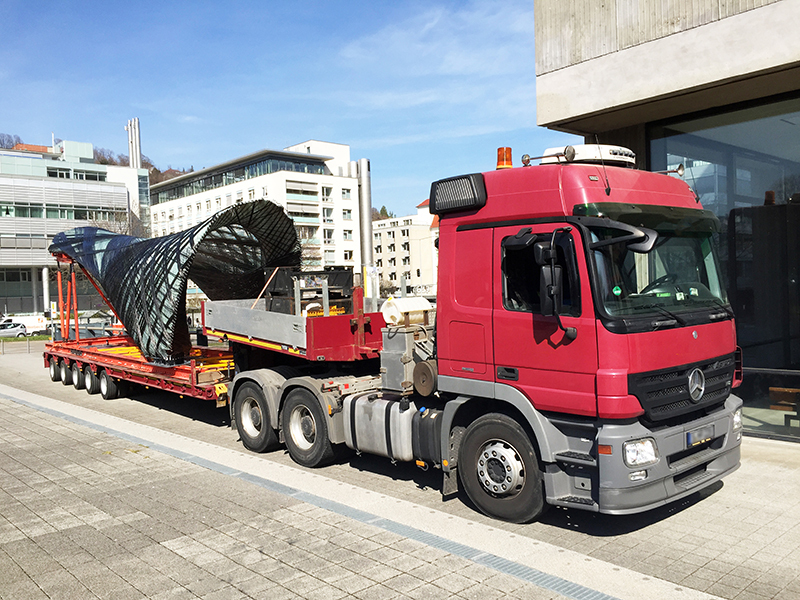 Traditional methods of fabrication require full-scale surface moulds and often restrict the process to serialized production of identical parts. 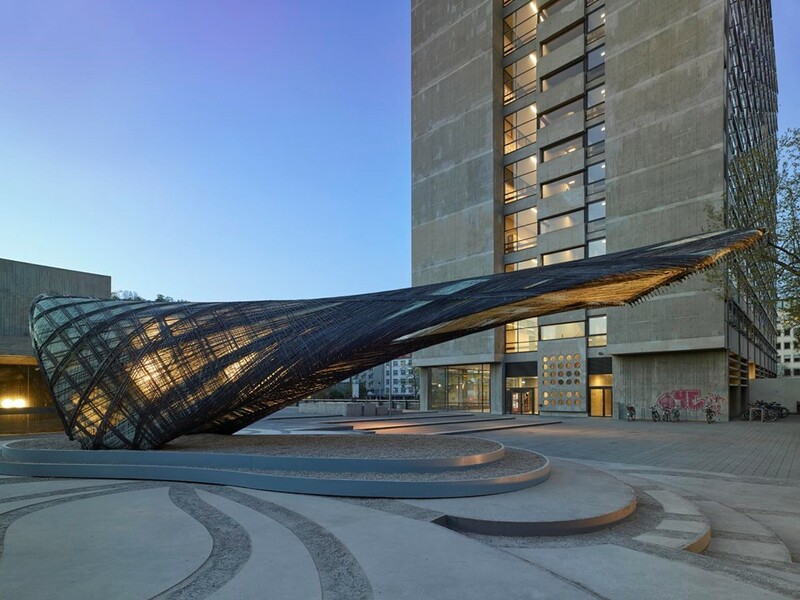 Previous research at the ICD and ITKE has explored fibre composite construction without the need for surface moulds or costly formwork. 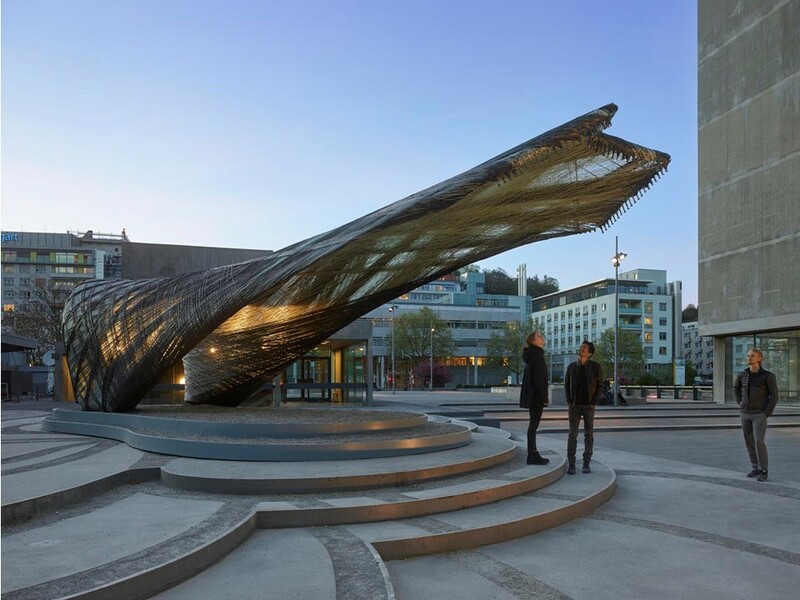 These novel manufacturing processes have been utilized to create highly differentiated multi-layered structures, functionally integrated building systems and large element assemblies. 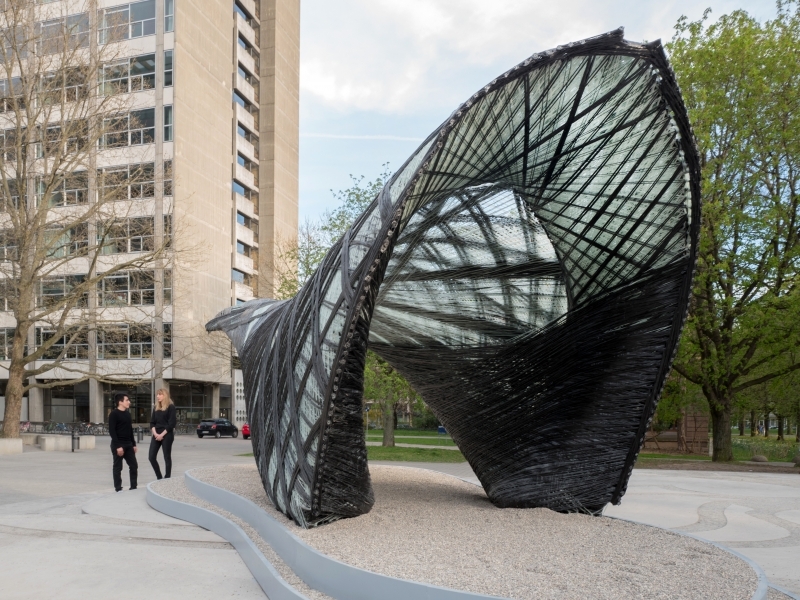 They have freed the relatively formable material from the limitations of traditional fibre composite fabrication processes. 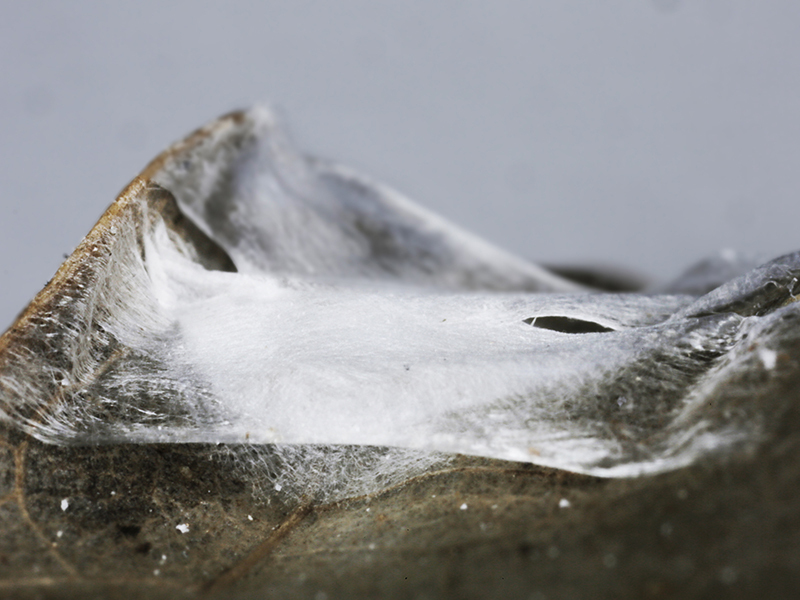 However, the scale of these early investigations has been limited by the working space of the industrial robotic arms that were utilized. 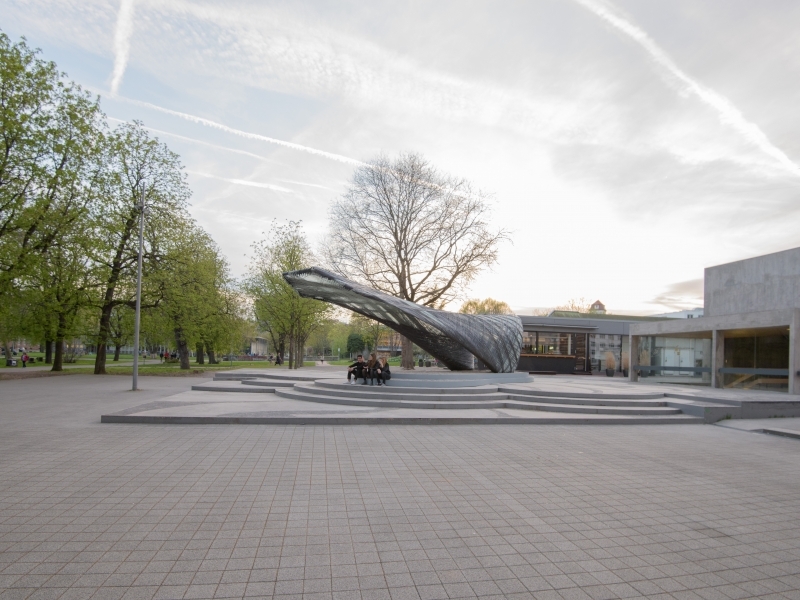 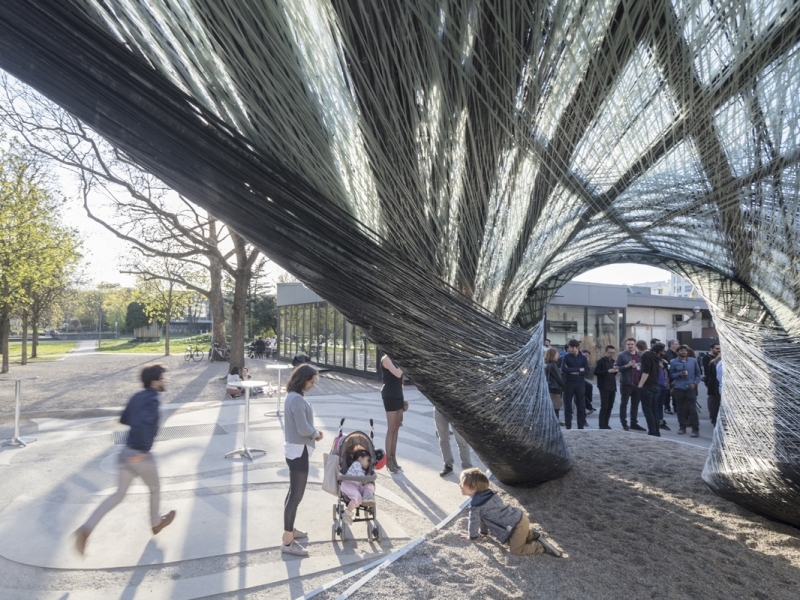 The goal of the ICD/ITKE Research Pavilion 2016-17 is to envision a scalable fabrication process and to test alternative scenarios for architectural application by developing a manufacturing process for long span continuous fibre structures. 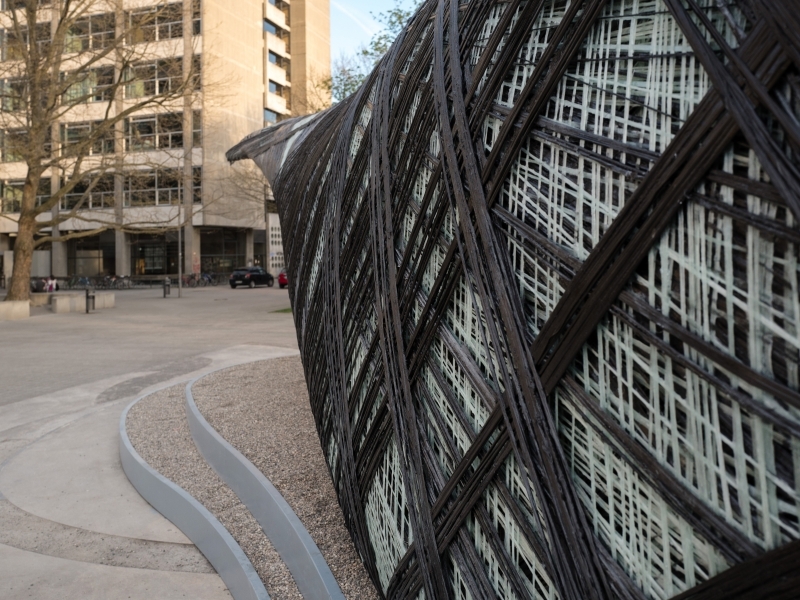 The focus of the project is a parallel bottom-up design strategy for the biomimetic investigation of natural construction processes of long span fibre composite structures and the development of novel robotic fabrication methods for fibre reinforced polymer structures. 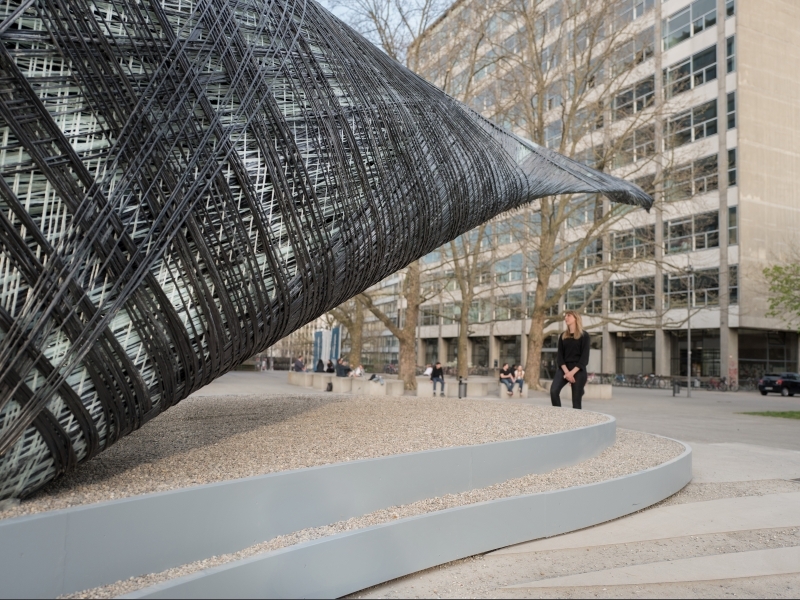 The aim was to develop a fibre winding technique over a longer span, which reduces the required formwork to a minimum whilst taking advantage of the structural performance of continuous filament. 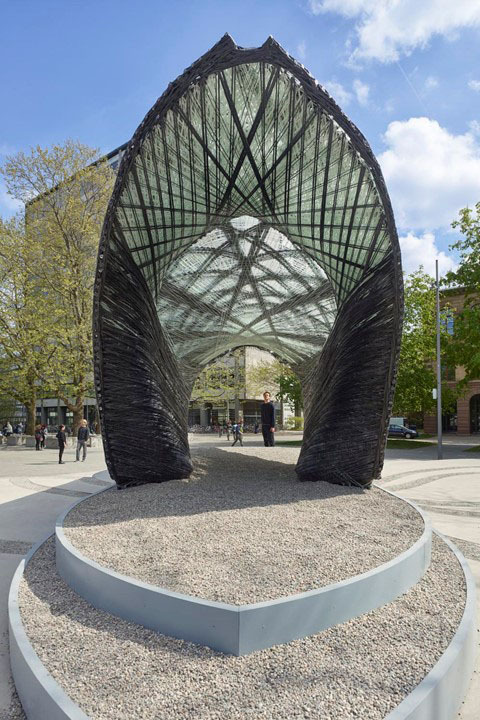 Therefore, functional principles and construction logics of natural lightweight structures were analysed and abstracted in cooperation with the Institute of Evolution and Ecology and the department for Paleobiology of the University of Tübingen. 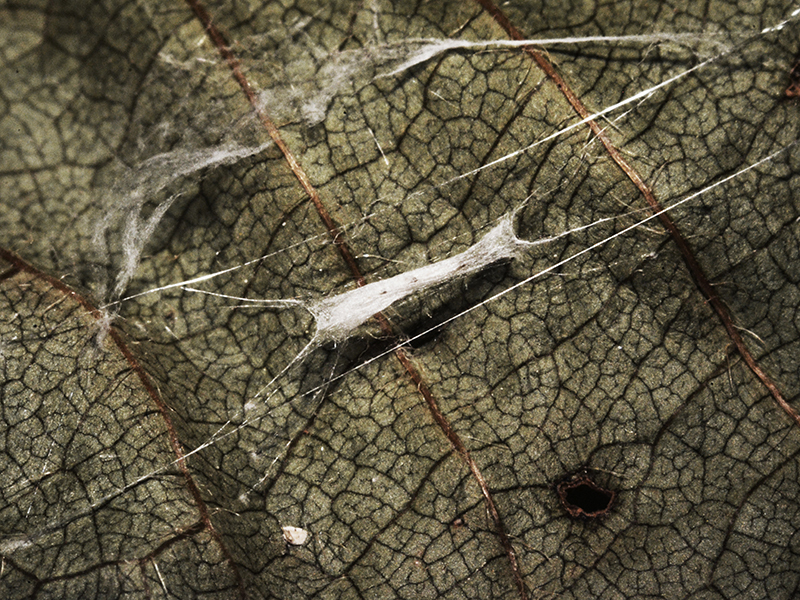 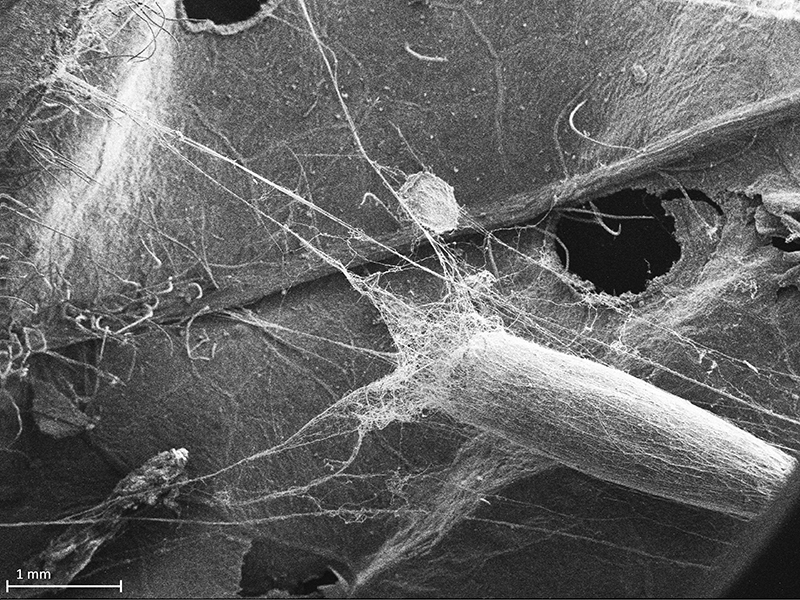 Two species of leaf miner moths, the Lyonetia clerkella and the Leucoptera erythrinella, whose larvae spin silk “hammocks” stretching between connection points on a bent leaf, were identified as particularly promising for the transfer of morphological and procedural principles for long span fibrous construction. 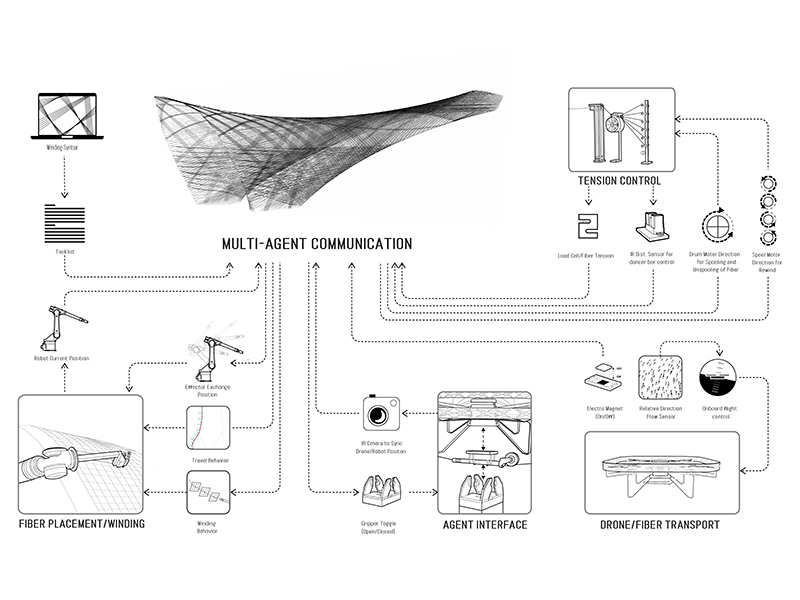 Several concepts were abstracted from the biological role models and transferred into fabrication and structural concepts, including: the combination of a bending-active substructure and coreless wound fibre reinforcement to create an integrated composite winding frame, fibre orientation and hierarchy over a long span structure and multi-stage volumetric fibre laying processes for the generation of complex three dimensional geometries. 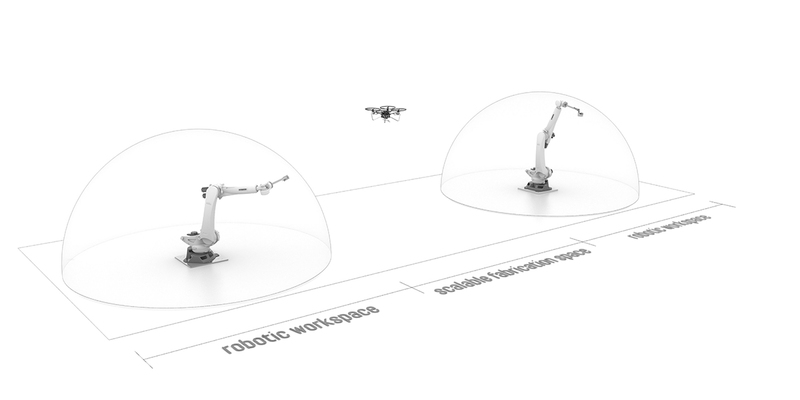 Creating a long span structure, beyond the working space of standard industrial fabrication equipment, required a collaborative setup where multiple robotic systems could interface and communicate to create a seamless fibre laying process. 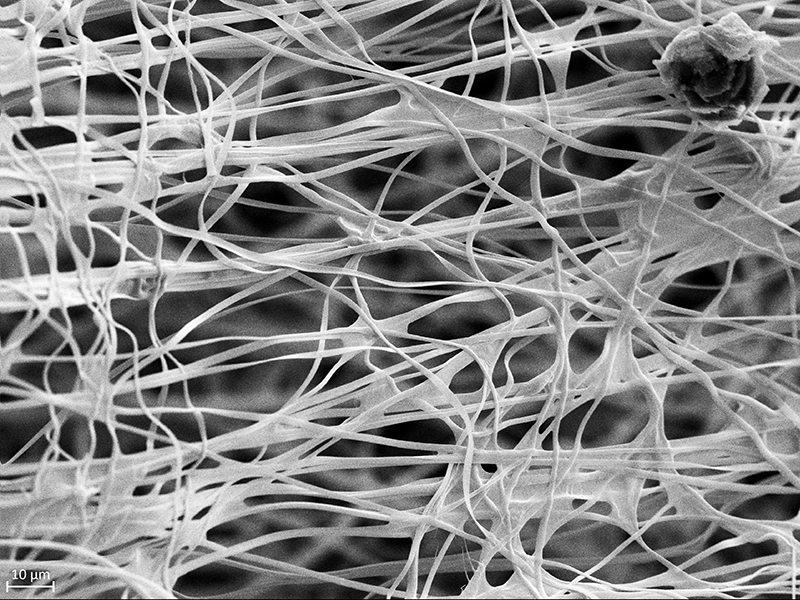 A fibre could be passed between multiple machines to ensure a continuous material structure. 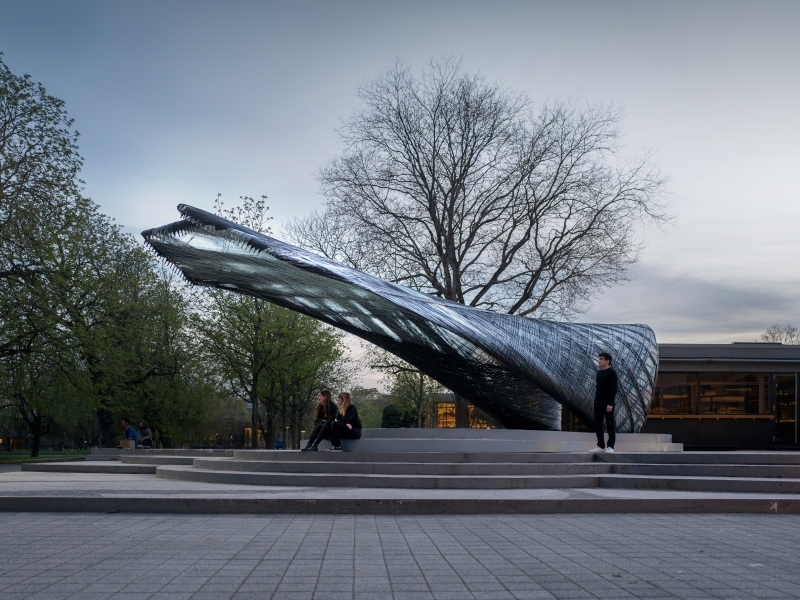 The concept of the fabrication process is based on the collaboration between strong and precise, yet stationary machines with limited reach and mobile, long-range machines with limited precision. 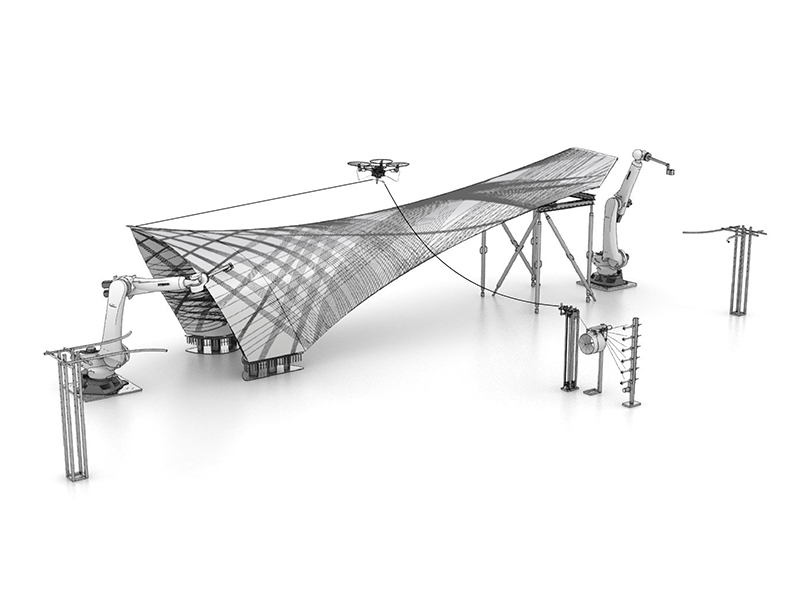 In the specific experimental set-up, two stationary industrial robotic arms with the strength and precision necessary for fibre winding work are placed at the extremities of the structure, while an autonomous, long range but less precise fibre transportation system is utilized to pass the fibre from one side to the other, in this case a custom-built UAV. 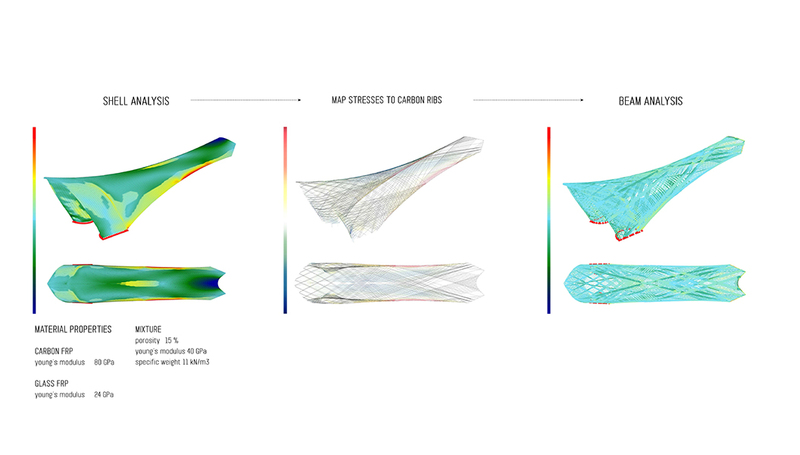 Combining the untethered freedom and adaptability of the UAV with the robots, opened up the possibilities for laying fibres on, around or through a structure, creating the potential for material arrangements and structural performance not feasible with the robot or UAV alone. 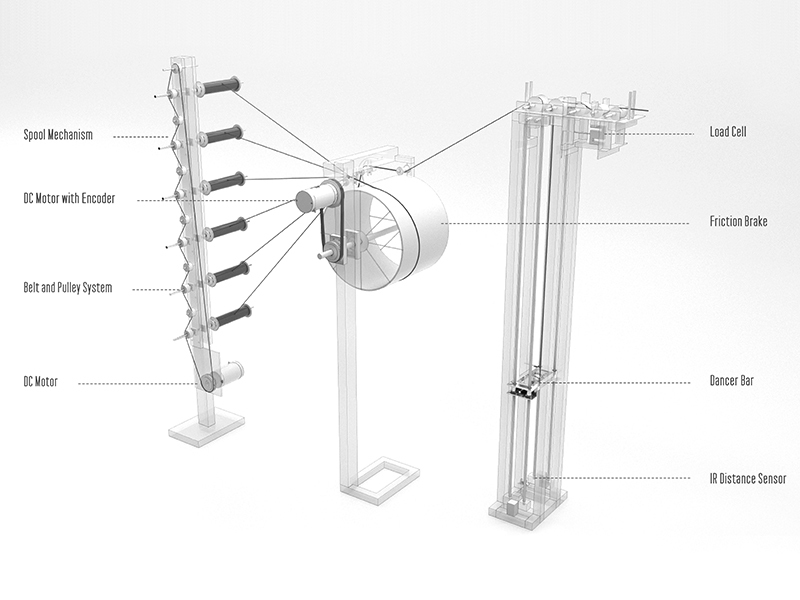 An adaptive control and communication system was developed to allow multiple industrial robots and a UAV to interact throughout the winding and fibre laying processes. 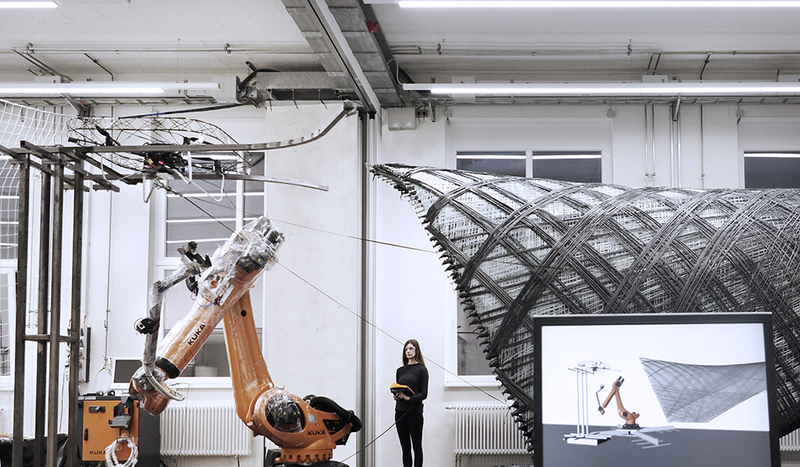 An integrated sensor interface enabled the robots and UAV to adapt their behaviours, in real time, to the changing conditions during fabrication. 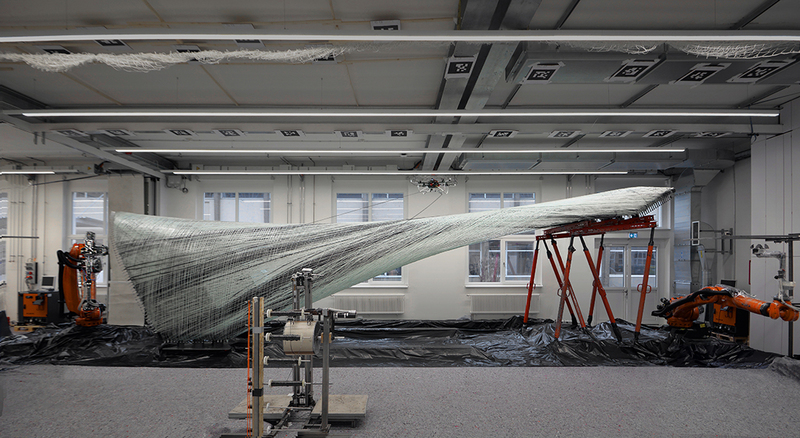 The UAV could fly and land autonomously without the need of human pilots, the tension of the fibre was actively and adaptively controlled in response to both the UAV and robot behaviours. 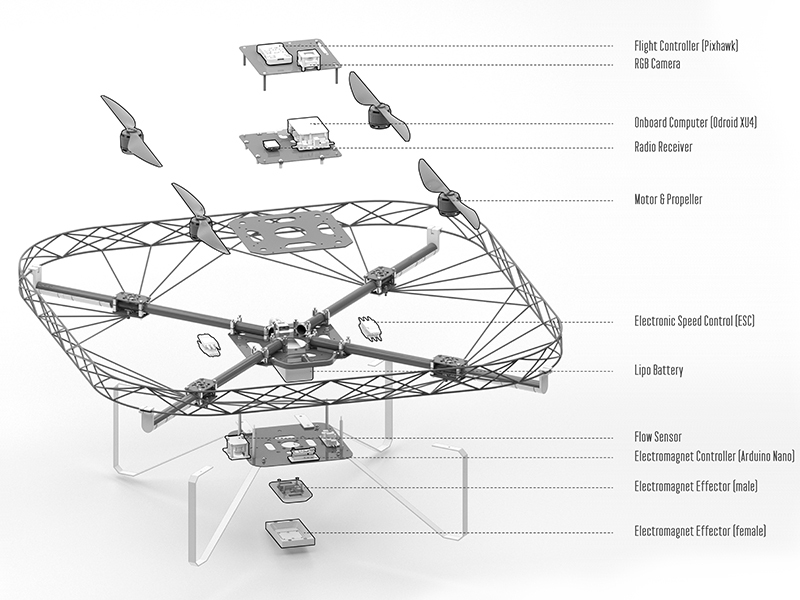 A localization system was utilized to create a digital and physical “handshake” between the robot and the UAV in order to pass the fibre back and forth throughout the winding process. 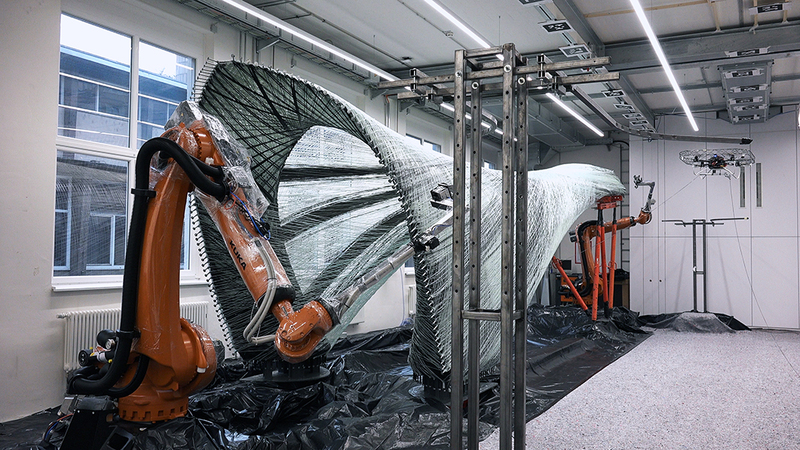 The series of adaptive behaviours and integrated sensors lay the foundation for developing novel multi-machine, cyber-physical fabrication processes for large scale fibre composite production. 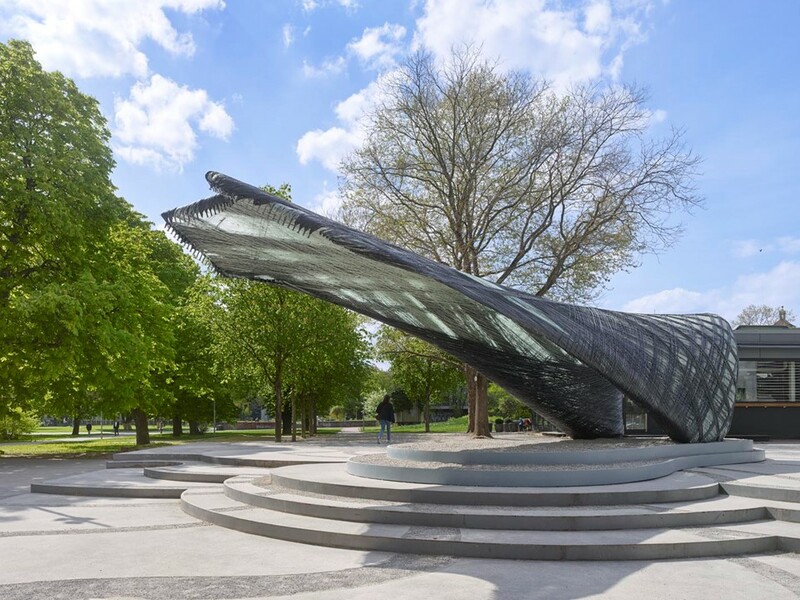 The ICD/ITKE Research Pavilion 2016-17 was created by laying a combined total of 184 km of resin-impregnated glass and carbon fibre. 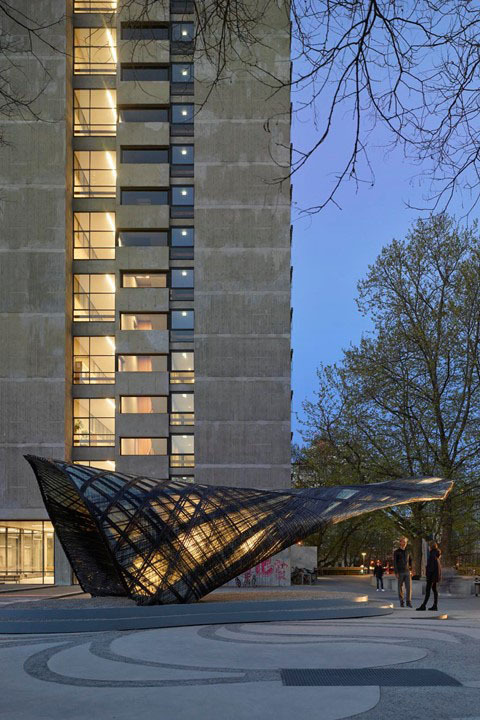 The lightweight material system was employed to create and test a single long spanning cantilever with an overall length of 12 m as an extreme structural scenario. 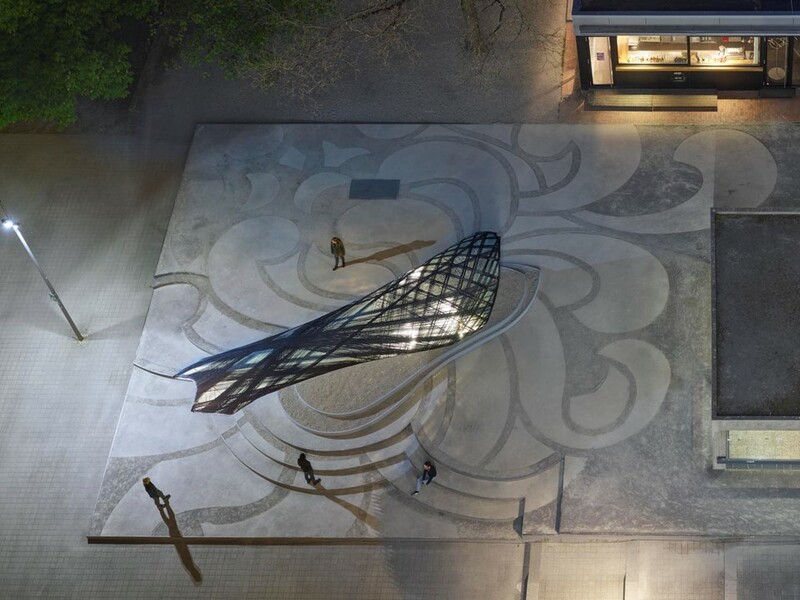 The surface covers an area of about 40 m² and weighs roughly 1000 Kg. 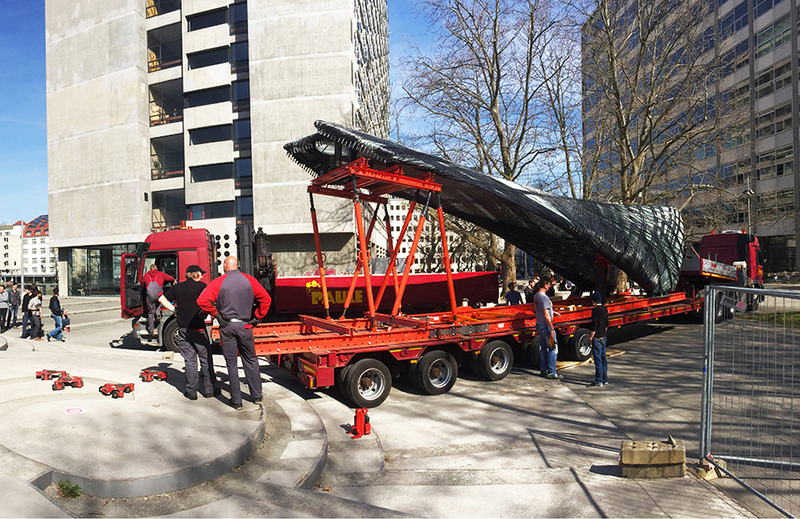 The realized structure was manufactured offsite and thus the size was constrained to fit within an allowable transport volume. 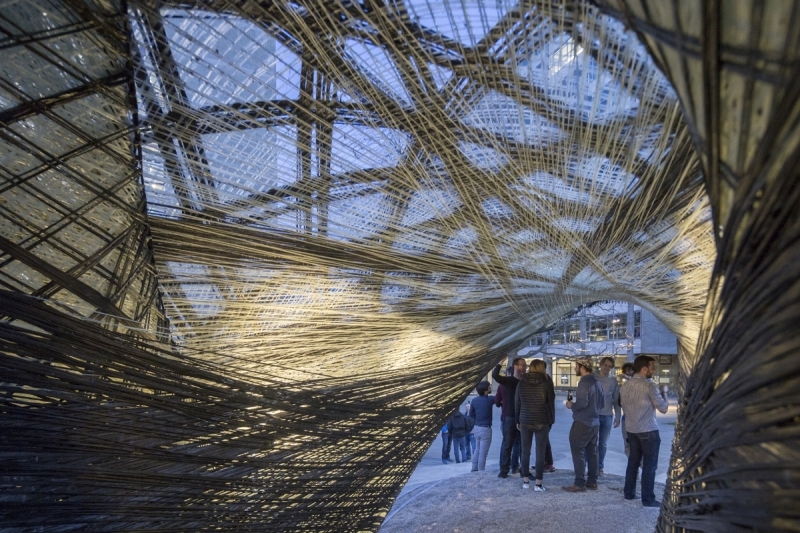 However, variations of the setup were found suitable for on-site or in situ fabrication, which could be utilized for much longer span and larger fibre composite structures. 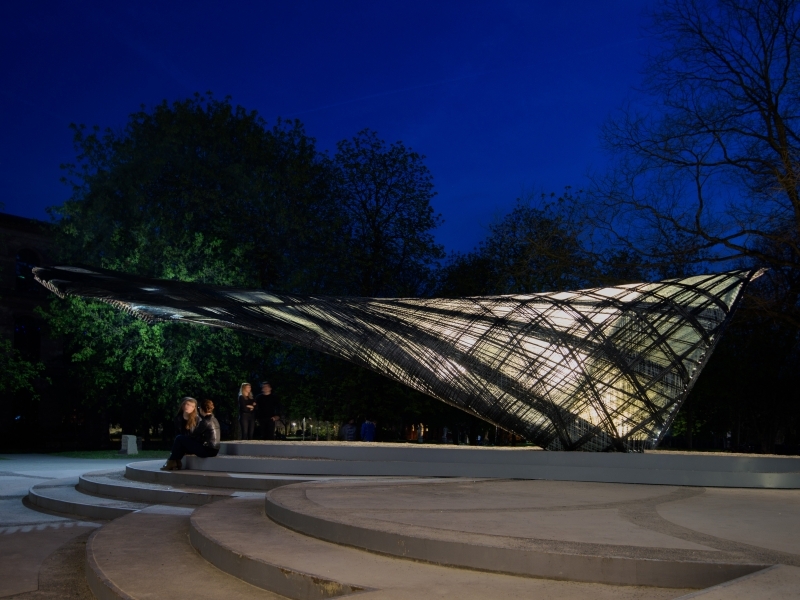 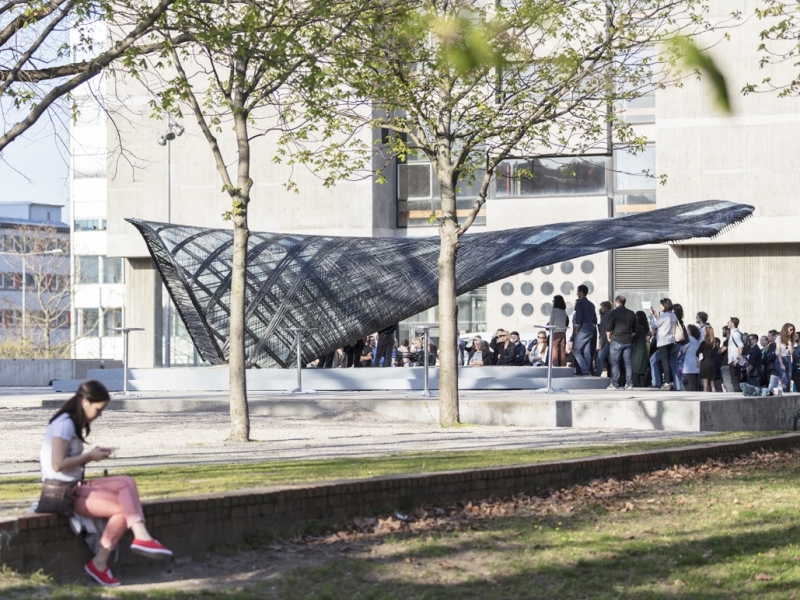 The pavilion’s overall geometry demonstrates the possibilities for fabricating structural morphologies through multi-stage volumetric fibre winding, reducing unnecessary formwork through an integrated bending-active composite frame, and increasing the possible scale and span of construction through integrating robotic and autonomous lightweight UAV fabrication processes. 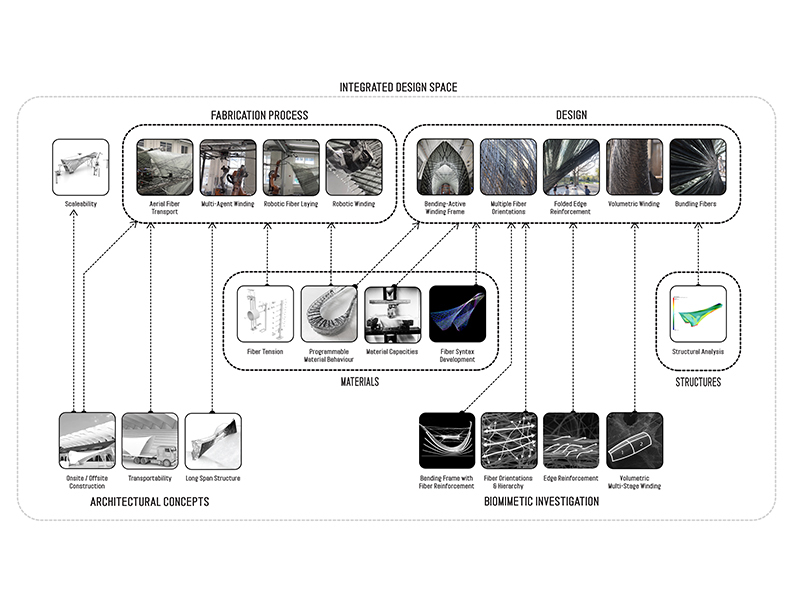 It explores how future construction scenarios may evolve to included distributed, collaborative and adaptive systems. 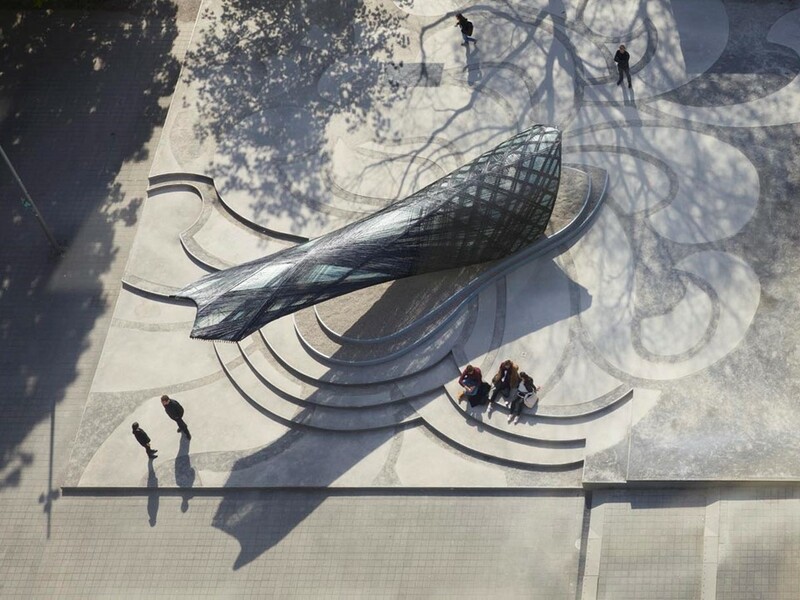 This research showcases the potential of computational design and construction through the incorporation of structural capacities, material behaviour, fabrication logics, biological principles and architectural design constraints into integrative computational design and construction. 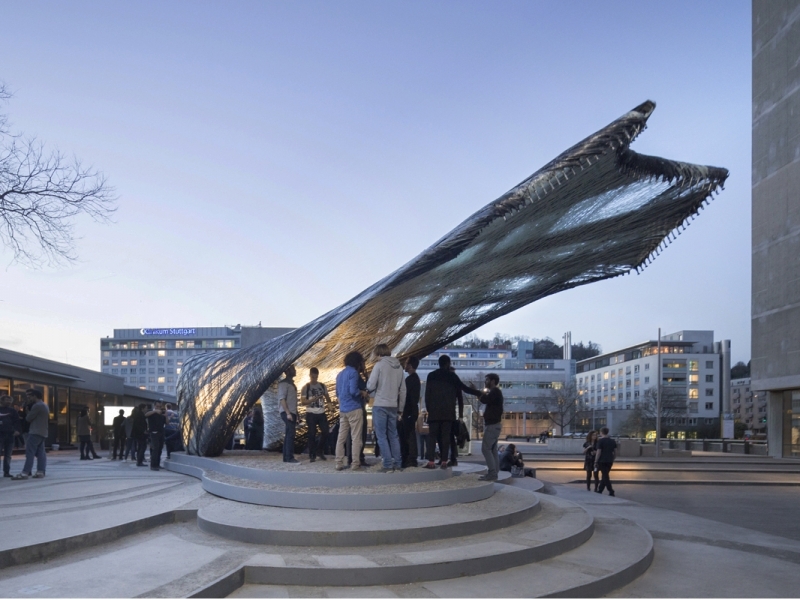 The prototypical pavilion is a proof-of-concept for a scalable fabrication processes of long-span, fibre composite structural elements, suitable for architectural applications.